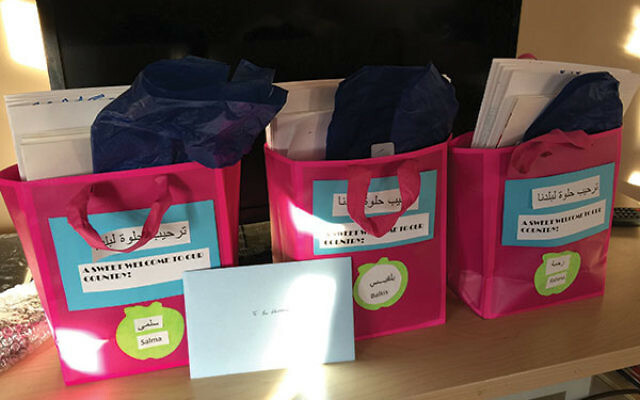 Welcome bags for each of the three children. In the late afternoon of Jan. 17, a small group of New Jerseyans waited at Newark Liberty International Airport to welcome five people they had never met. Hours after the plane had landed, the travelers — a mother, father, and their three daughters — refugees from war-torn Syria, finally emerged. It was just 10 days before President Donald Trump issued an executive order banning all refugees from Syria. The locals, members of three South Orange synagogues, escorted the family to their new home, an apartment on the second floor of a pretty house on a quiet street in Maplewood. The youngest, age 6, loved her toys and room, and the older girls, ages 16 and 20, couldn’t contain their excitement over their L-shaped bunk beds. At the family’s insistence, their new friends joined the immigrants for the first meal in their home, provided by the South Orange restaurant, Felafally Yours. Resettling these immigrants is a joint effort of Congregation Beth El, Temple Sharey Tefilo-Israel, and Oheb Shalom Congregation, all in South Orange, in partnership with Church World Service. Each of the three congregations had separate plans to sponsor refugees, but they started working together first last spring and again this fall to combat several anti-Semitic incidents in the local middle school. In early December, they announced that together they would adopt a Syrian refugee family. Trump’s executive order, issued on Friday, Jan. 27, indefinitely bans Syrian refugees from entering the United States, and suspends refugees from six other countries for the next four months. The order, which threw into question the future of some refugees already en route to the United States and others within days of receiving approval, led to protests at airports around the country, including Kennedy and Newark airports, as well as at local detention centers, where arriving immigrants are held until their status is determined. Currently the family is unavailable to speak with the media and their names and images have been omitted from this story to protect their identities. Despite the ban, the synagogues’ ultimate goal, according to Rabbi Jesse Olitzky of Beth El, is to resettle “as many refugee families as possible in our community.” Olitzky participated in the protests at Newark airport, along with Rabbi Matthew Gewirtz of Temple Bnai Jeshurun in Short Hills, and other community leaders. Since taking on this project, the three synagogues have raised more than $35,000 through a GOFUNDME campaign toward a goal of $75,000, which, pending legal challenges to Trump’s executive order, they hope will help them resettle at least two additional refugee families by this spring. The dollar amount needed to resettle a family was set after a series of conversations among experts in the field, and reflect a kind of “guesstimate,” said Liba Beyer, who sits on the steering committee for the undertaking; the committee is comprised of two members from each synagogue, selected for their expertise in a particular area. Sheryl Harpel, a member of the synagogues’ steering committee, was also there to greet the family. “There were instant hugs and kisses.” She said she and the mother cried “happy tears” as they walked arm-in-arm through the airport. All the preparation for the family’s arrival had been completed in the span of just over a month. More than 150 people, mostly from the three synagogues but also from the broader South Orange-Maplewood community, had worked feverishly, donating not only their time but also everything they would need. Two days before the family’s arrival, their apartment had been rented by the synagogues and was nearly ready for move-in. Over time, the family is expected to take over paying the rent on an incremental basis. Others were involved. A “welcome team” of students, faculty, and administration at Columbia High School worked together so that the 16-year-old would have a good first day. A social services team of synagogue members met with the parents so they would have whatever assistance they need, and a South Orange pediatrician arranged for the children’s medical care. Financial professionals will work with the parents so they can gain financial literacy and independence. The synagogues chose to partner with Church World Service (CWS) because of its willingness to work with community organizations and its comprehensive approach to settlement: CWS generally provides a dedicated caseworker, housing, furniture, clothing, food, and sets up medical appointments, as well as English as a second language access, school registration, transportation, job and cultural orientation, and skills training. 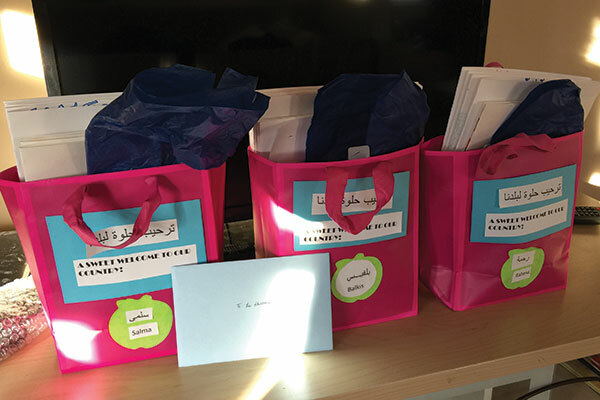 In this family’s case, the synagogues have taken on these tasks, with guidance from CWS. While this Syrian family was the first to be settled in Maplewood, there is a growing network of Syrian refugees in New Jersey. Close to 300 were settled in New Jersey, many in Elizabeth, between October 2015 and September 2016, and 73 between October and December 2016, according to the U.S. Department of State. Harpel said the initiative has enabled her to deepen relationships with Muslims such as the mother of one of her daughter’s friends. “I’m learning about the traditions in the mosque and personal observance, not something I would have asked about. This has given us a reason to talk about things we normally stay away from. Like, ‘Hey, do you go to a mosque? Which is the right one for this family? What’s the difference between mosques? What kind of programs do they have there?’ And people in the Muslim community are surprised and just delighted we are doing this, and they are eager to help.